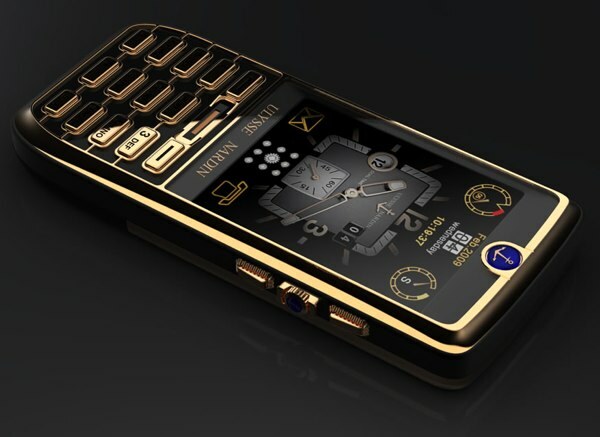 This is the "Chairman" phone by renown Swiss watch company Ulysse Nardin. The company is named after Ulysse Nardin a man who began making marine chronometers in the late 1800's which allowed for accurate time keeping for military ships prior to the invention of quartz movement and current digital technologies controlled by computers. The company today specializes in complication watches. A complication is a term mostly referring to mechanical watches with no electrical or digital components. It's any function of these watches that goes further than just keeping track of hours, minutes, and seconds.The Chairman Phone takes it one step further incorporating the many years of building mechanically superior time wear with amazing advances in cellular technology. Generally we just whip out our Centurion or Visa Black card and say "Take my money" and dont question the price when we find stuff like this, we did however over hear someone say the base model Chairman phone went for around $14K and the diamond version about $130,000. My Galaxy S2 toasts it.